December | 2011 | Hand Luggage. Determined to get Neil into something cultural we head for the Vatican Museums. Well, we go round the corner from St Peters and slap bang into an EPIC queue! We stand in a queue that stretches forever, in total we probably wait about two hours to get into the Vatican museums, but I am determined that we will see some art!!! Here’s a piccy from Wikipedi that gives you the gist of the queue we were in!!! What a nightmare! Obviously one of the main sights we wanted to see was the Sistine Chapel, but that’s just a tiny part of what the museums have to offer. One of my favourite bits was the Gallery of Maps, topographical maps of the whole of Italy, painted on the walls by friar Ignazio Danti of Perugia, commissioned by Pope Gregory XIII (1572–1585). It remains the world’s largest pictorial geographical study. Here is the ceiling, an amazing, colourful mural of exquisite paintings. 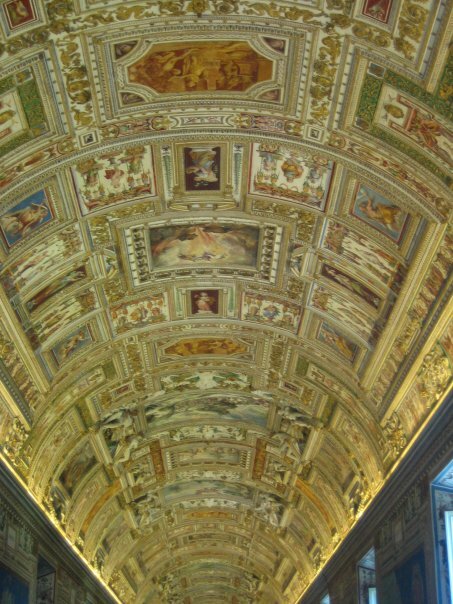 The other highlights were The four Stanze di Raffaello (“Raphael’s rooms”) that form a suite of reception rooms, the public part of the papal apartments. They are famous for their frescos, painted by Raphael and his workshop. The four rooms are Room of the Segnatura Room of Heliodorus: Room of the Fire in the Borgo and the Room of Constantine. 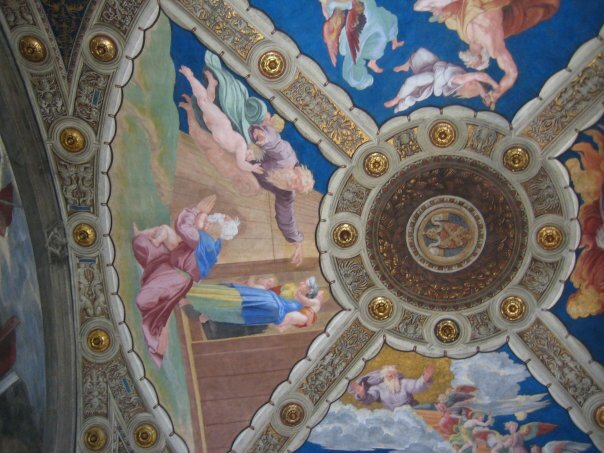 Here is the ceiling in the Room of Heliodorus. And here is another elaborate room. 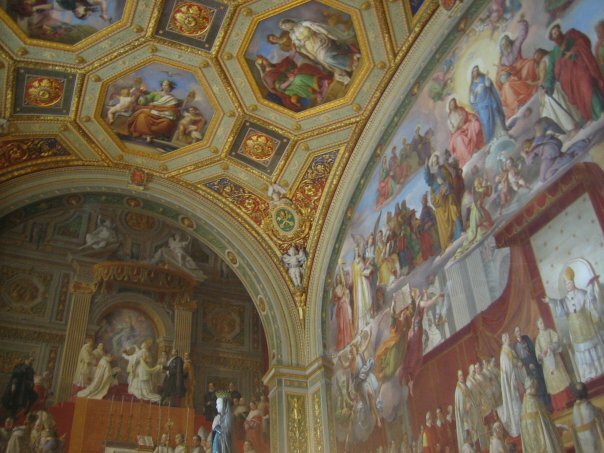 One of the primary functions of the Sistine Chapel is as a venue for the election of each successive pope in a conclave of the College of Cardinals. On the occasion of a conclave, a chimney is installed in the roof of the chapel, from which smoke comes out as a signal. If white smoke appears, created by burning the ballots of the election, a new Pope has been elected. If a candidate receives less than a two-thirds majority, the cardinals send up black smoke—created by burning the ballots along with wet straw and chemical additives—it means that no successful election has yet occurred. Here’s the famous ceiling The Creation of Adam by Michangelo. 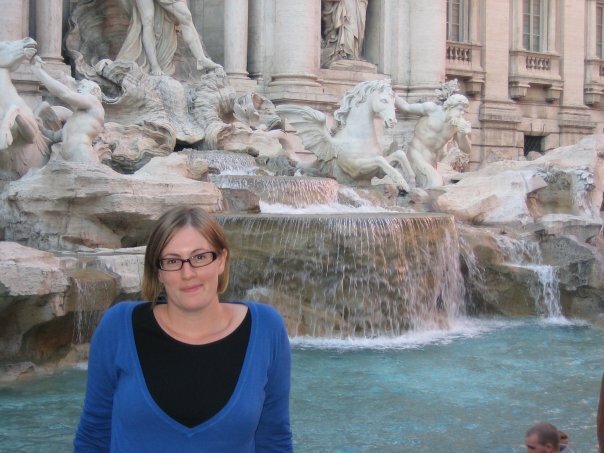 After marvelling at the Sistine Chapel we headed onwards to another tourist highlight, the Trevi Fountain. Here I am looking goofy in front of it. Apparently around 3,000 Euros are thrown in the fountain EVERY day! That’s about it from Rome for now. I am sure I will add a few more photos when I have time.